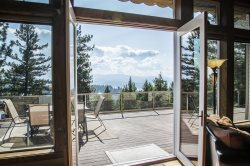 Located in Hayden with 180 degree panoramic views of surrounding area and Hayden Lake. Private and serene, this newly remodeled home sits on 12 acres at the peak of a small mountain overlooking the South end of beautiful Hayden Lake. Your family will enjoy lounging while you BBQ under the gazebo, watching the rolling clouds in the morning and the long sunsets in the evening from the expansive back patio. Walking into the home you'll be greeted by the 180-degree view of the lake out of the large windows in the living room. With an open floorplan, this house has room for the whole family to enjoy! Curl up around the fireplace or play around of ping pong while catching the game on the 60 inch SmartTV. Just to the right of the living room is the kitchen, complete with bar seating for 4, stainless steel appliances and granite counter tops. The dining table extends for up to 8 guests. Three bedrooms are on the main floor, the master bedroom complete with a king bed, private seating for 2 and a luxurious master bathroom. Double vanity sinks are complemented by the soaking tub for two and glass shower. Also on this level are two other bedrooms both with queen beds and attached bathrooms with tub and shower combos. Around the corner from the kitchen is the laundry room with front load washer and dryer, and a large mudroom to drop all of your outdoor activities. A half bath completes this room and leads you downstairs through the single car garage and into the private add-on. The 4th bedroom has a king bed and an attached bathroom with a standing shower. To make things better there is a personal living room with a queen pull-out sofa and twin pull out bed with SmartTV for a quiet night in. Just 15 minutes to Honeysuckle Beach or 30 minutes to downtown Coeur d'Alene puts your vacation in the ideal location for rest and relaxation.